Have you recently completed a hospital stay after an illness or injury? Perhaps you fell and broke a bone that needed surgery, or maybe you have had a mild heart attack or stroke. In these situations, you may not be quite ready to return to full independence once you leave the hospital. Your body may need additional recovery time and you may still have some difficulty getting around as well as you did before. But asking someone to come into your home and help out can be a significant source of apprehension. How do you know you can trust that person? What if you don’t get along? And what if they try to change your routines or ignore your preferences? At Cherished Companions, we understand that concerns like these can be unsettling. That’s why we work closely with you to answer all of your questions so you feel confident and secure in your decision about selecting an in-home caregiver. What Is Professional Home Care? Our careful attention to detail in our caregiving practices and hiring processes has made us one of the premier care agencies in the state of Ohio and in the nation. We’ve been recognized by Home Care Pulse as a Best of Home Care Provider of Choice, Employer of Choice, and as a Leader in Excellence. We were also ranked #3 out of the top 50 senior services providers in the nation in Fortune Magazine’s Best Places to Work in Aging Services in the At Home Care Category in 2018. What does that mean for you? It means you can trust us to provide the best possible care, to treat you and your home with dignity and respect, and to make sure you are pleased with the service you receive. What Will An In-Home Care Arrangement Look Like? To help you choose the care plan that is right for you, we will meet with you in your home or in our office before you sign up. We’ll talk through your needs and expectations and work with you to create a customized plan. How Do I Know I Can Trust My Caregiver? 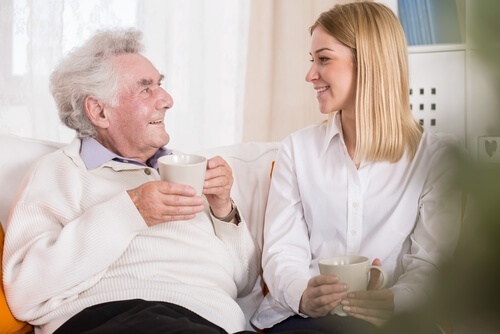 We want to make sure you are 100% comfortable with the caregiver who will visit you in your home. That’s why we give special attention to matching you with the right caregiver. Our goal is not only to serve you well, but also to develop a positive relationship with you based on trust. We encourage you to read some of the many wonderful reviews we have received from our clients so you can hear about the experiences others have had with our caregivers. We also have an A+ rating with the Better Business Bureau as well as numerous awards for our high quality care. What are your fears? Do you worry about having a stranger in your home? Are you concerned about personality clashes? What would you like to gain from working with a care provider? Are you looking mainly for help with household responsibilities, or do you need help with personal care as well? Are you looking forward to having someone to talk to every day? What things would you like to take care of yourself? What things would you like the caregiver to do? Are there certain tasks you enjoy doing? Do you feel uncomfortable having a caregiver help with certain responsibilities? How much care do you anticipate needing? Do you need care just for a little while as you recover from a surgery or illness? Do you expect to need care long-term? Do you have family available to help out on a regular basis or do they live elsewhere? We would love to talk through all of these considerations with you so that we can customize your care plan based on your specific situation. If you have additional questions about what in-home care might look like for you or whether home care is the right choice, please give us a call! We’re always ready to help!